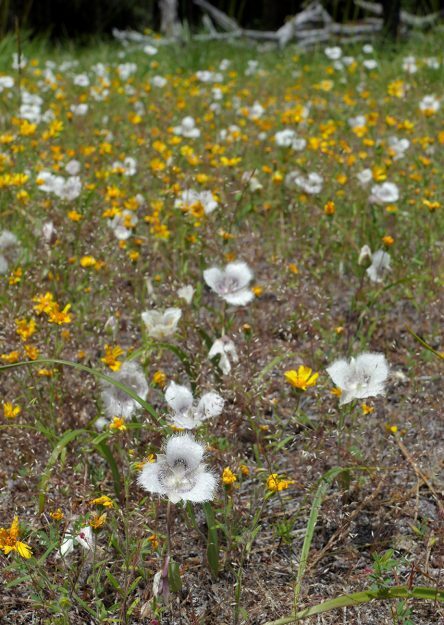 On Saturday, June 24, Molly Juillerat and I co-led a wildflower field trip for the Southern Willamette Forest Collaborative, a group of people interested in restoration of the Rigdon area, southeast of Oakridge. Their previous field trip had been to see the Jim’s Creek area, which has been undergoing major restoration work for a number of years. 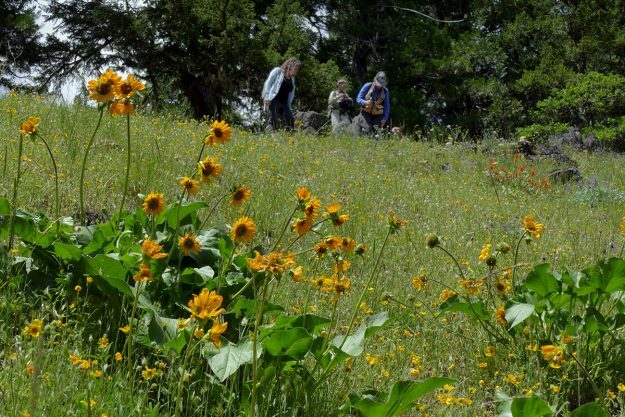 The Youngs Rock trail starts in the Jim’s Creek area along Rigdon Road 21. 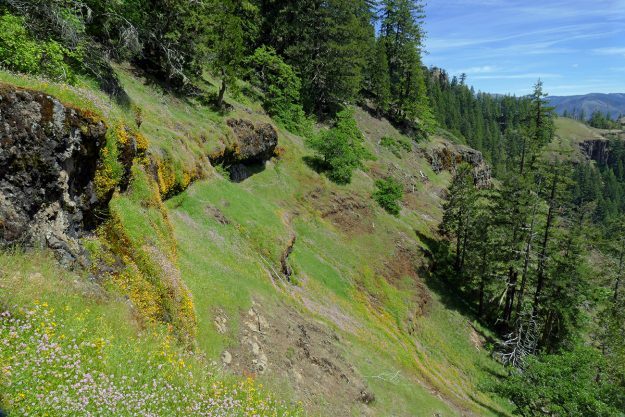 We had planned to show people the wonderful trail going up to Youngs Rock starting just above the Jim’s Creek restoration area. 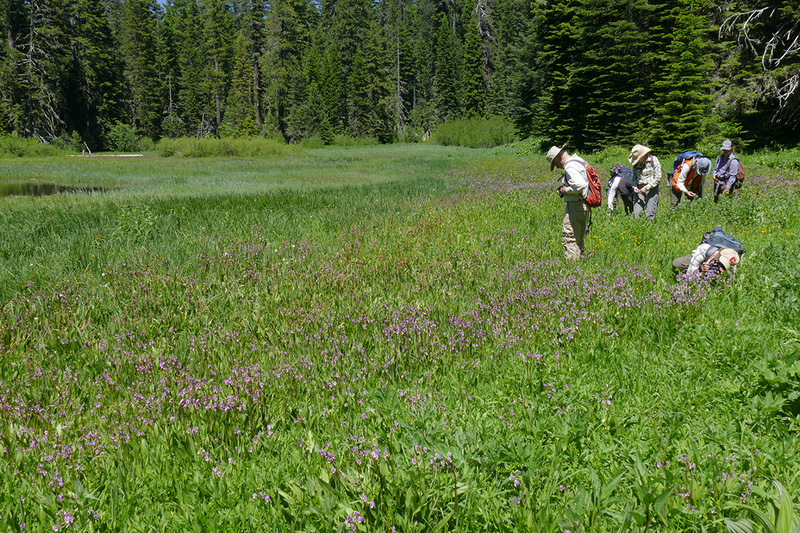 We had pre-hiked it with some friends the previous Saturday, June 17, but when the weather forecast showed temperatures soaring above 100°F, we felt that it would be entirely too hot for an uphill climb through dry meadows and rocky habitat. Instead, we moved the trip farther uphill to Moon Point, which connects with the upper part of the Youngs Rock trail. 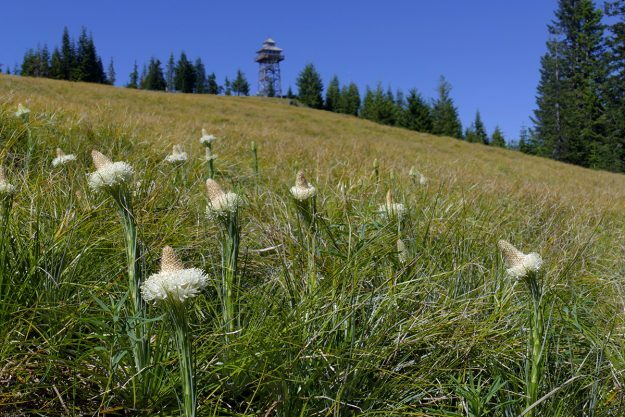 At about 5100′, The snow there had only melted within the last few weeks, and the more or less level trail through damp meadows would be much more pleasant on such a hot day. Indeed it was a lovely day, and other than lots of mosquitoes (not aggressive, however), we had a great time. Here are a few highlights from both trips. Some of the Youngs Rock group admiring wildflowers including balsamroot (Balsamorhiza deltoidea) in one of the upper meadows. 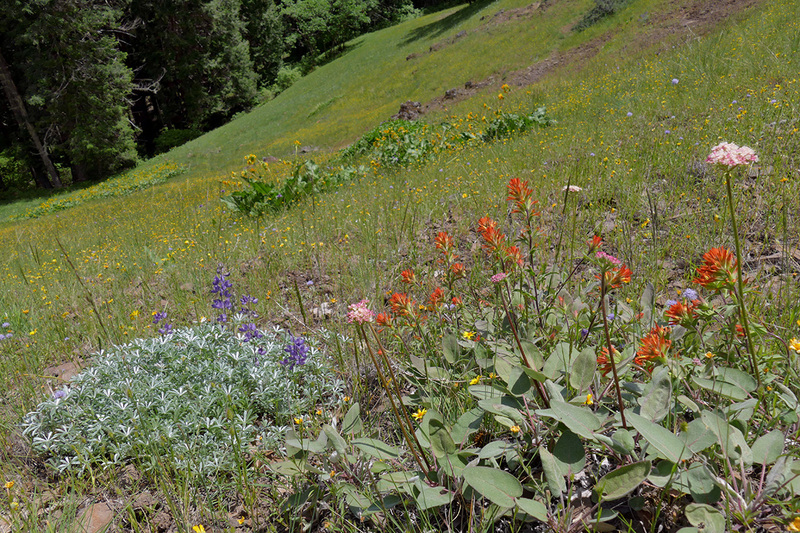 Both paintbrush and silvery lupines adorned the meadow above the balsamroot. 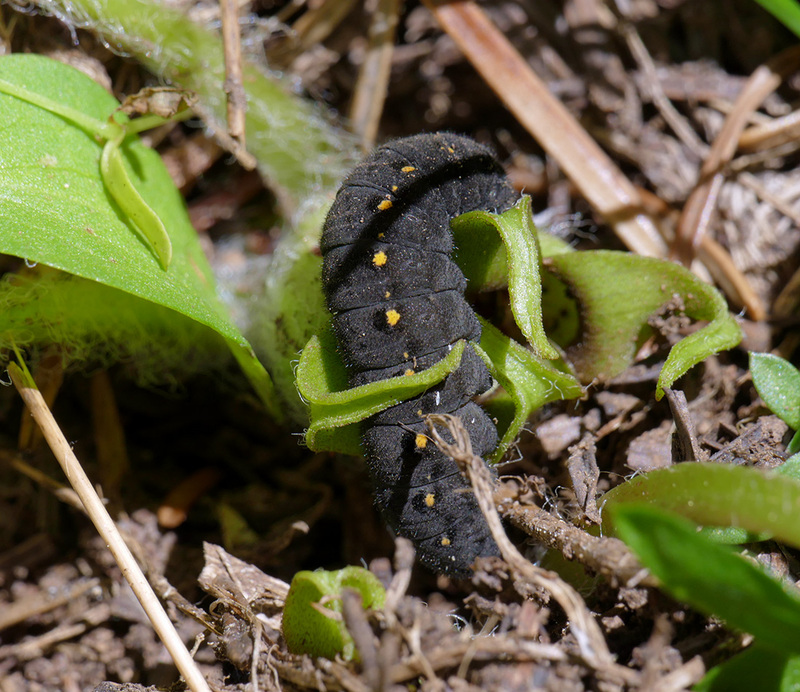 A gold star for the woman who spotted this caterpillar climbing on the flower of the rare green-flowered wild ginger (Asarum wagneri) along the Moon Point trail. I’m pretty sure it’s a Clodius parnassian caterpillar, one I’ve been hoping to see for years. Its host food plant is supposed to be bleeding heart (Dicentra formosa), common in the area. It didn’t appear to have eaten the ginger but was just passing through. 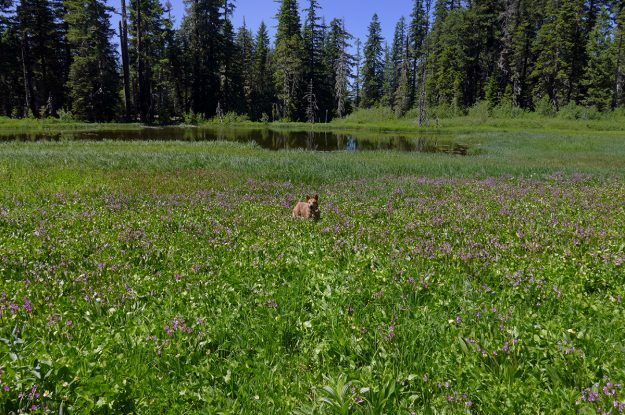 Ruby, Molly’s dog, was thrilled to cool her feet in the water beneath a beautiful spread of mountain shooting star (Dodecatheon jeffreyi) by Moon Lake. She also took a quick but joyful dip in another nearby pool of water. Unlike Ruby, the rest of us were trying not to get our feet wet as we admired the floral display in the wetland. 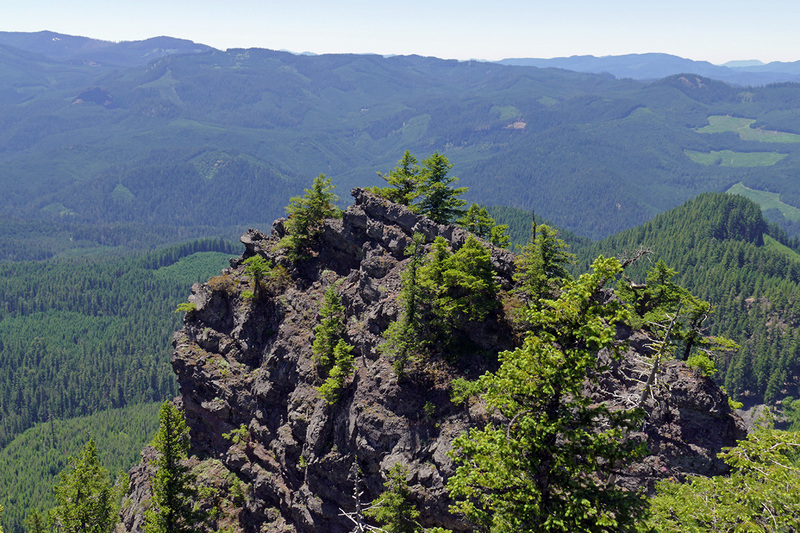 At the end of the Moon Point trail, the forest and meadows suddenly give way to the rocky cliffs of Moon Point itself and a great view south to the Calapooyas and beyond to the North Umpqua area. After our hike to Moon Point, we drove up the road to see the Warner Lookout. Beargrass (Xerophyllum tenax) was just beginning in a few spots, but there were loads of buds appearing in the clumps. It looks like there will be quite a show in a few weeks.